KUALA LUMPUR (March 19): Hong Leong Investment Bank Bhd downgraded its Dayang Enterprise Holdings Bhd share recommendation to sell from buy on the belief that the market is pricing in much stronger earnings expectations, which may not be sustainable for the oil and gas support services provider. In a note today, Hong Leong analyst Sean Lim Ooi Leong said the research firm had however increased its sum-of-the-parts (SOP)-driven target price (TP) for Dayang to RM1.15 from 91 sen following an earnings adjustment for financial years ending Dec 31, 2019 (FY19) and 2020 (FY20). "We increase FY19-20 earnings by 26% and 12% to RM115.6m and RM108.8m with more bullish assumption of VOs (variation orders) kicking in as well as better margins from the work orders received. "Post earnings adjustment, our SOP-driven TP is increased to RM1.15 (from 91 sen). Since our upgrade to buy in Oct last year, share price has delivered a peak return of 200% before declining -18% this week. We advocate investors to take profit on the stock. Downgrade to sell as we believe the market is currently pricing in much stronger earnings expectations which may not be sustainable," Lim said. 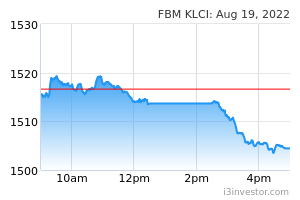 At Bursa Malaysia today, Dayang shares settled 19 sen or 11.7% down at RM1.43 with some 67 million units traded. 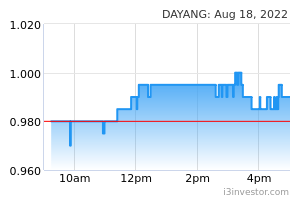 Dayang had emerged among Bursa Malaysia's top gainers and most-active stocks. Bruce88 Haha $1.15..just wait & see who is correct ! speakup look like Koon got enemies in Kenanga & Hong Leong. What an act by a MONSTER ! In Wall Street this is a sure win class action legal law suit against the 2 Ib. n today we can expect to have at least 5 advert on major newspapers by top law firms taking the 2 analysts n its co to court for causing losses n misery to dayang n more so to the s.holders. Tis a serious crime equivalent to a subset of 'mass murdering'. The evidences r in solid print n also the crash prices of dayang. Our dear LAWYERS, big biz is here, where r U ? ?